David Bowie, in his years at Bromley Technical High School before becoming David Bowie, studied not just music but art and design as well. Despite becoming a rock star, he never forgot about the importance of the visual, a sensibility manifest in the performances he put on, the personae he assumed, and the music videos in which he starred right up until his death earlier this year. After his success, the artist also became a full-fledged art connoisseur, and next month Sotheby's will hold Bowie/Collector, a series of three auctions "encompassing over 350 works from the private collection of the legendary musician." The first two auctions will sell Bowie's modern and contemporary art; the third will focus entirely on his collection of furniture and other pieces of design by Ettore Sottsass and the Memphis Group. 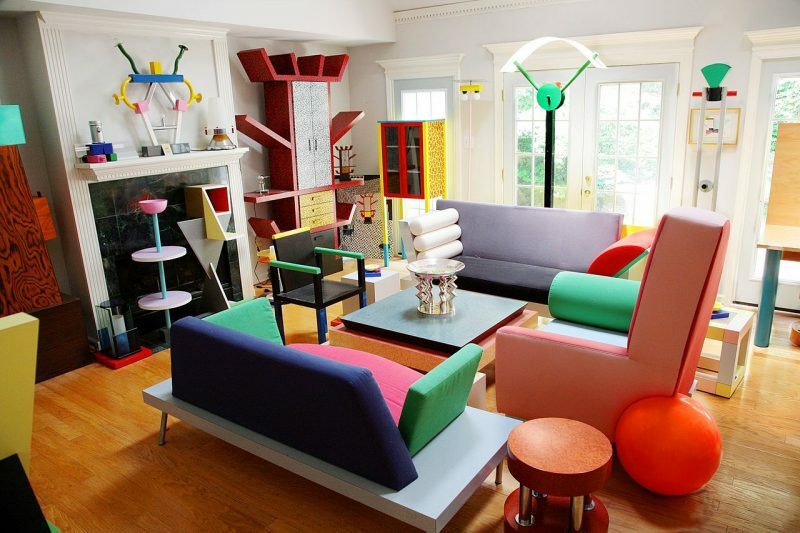 Even if you haven't heard of the Memphis Group, you've certainly seen their furniture. "It's Pee-Wee's Playhouse meets Miami Vice," in the words of Alissa Walker at Gizmodo. "It's Saved By The Bell plus Beetlejuice." As the postmodern wing of the 1980s Art Deco revival, Memphis "combined overtly geometric shapes from a variety of materials in bright, contrasting colors. Graphic patterns — usually black and white — were not unusual." Memphis, whose influence has extended far beyond the movement's official lifetime of 1981 to 1988, began "when Ettore Sottsass, one of Italy’s architectural grandees, met with a group of younger architects in his apartment on Milan’s Via San Galdino," according to Design Museum. (Sottass had made his name with, among other things, Olivetti's bright-red Valentine portable typewriter.) "They were there to discuss Sottsass’ plans to produce a line of furniture with an old friend, Renzo Brugola, owner of a carpentry workshop," an idea that turned into "an exuberant two-fingered salute to the design establishment after years in which color and decoration had been taboo." Why call it Memphis? During the meeting, the group put on Bob Dylan's song "Stuck Inside of Mobile (With the Memphis Blues Again)," which gave Sottass the inspiration. "Everyone thought it was a great name," wrote Memphis member, and later Memphis chronicler, Barbara Radice, with its evocations of "Blues, Tennessee, rock’n’roll, American suburbs, and then Egypt, the Pharoahs’ capital, the holy city of the god, Ptah." This aesthetic foment eventually produced such items found in the Bowie collection as Michele de Lucchi's Flamingo side table, Peter Shire's Bel Air armchair, Achille and Pier Giacomo Castiglioni's friendly-looking radio-phonograph, and Sottass' own Carlton room divider, the most popular Memphis object and one still made today. Always aesthetically polarizing, Memphis has undergone a bit of a revival in recent years: younger designers have looked to the group for ideas, and its surviving members have heard a new call for their special brand of bold colors and striking geometry. In the video at the top of the post, gallerists Leo Koenig, Margaret Liu Clinton, and Joe Sheftel show and tell about Memphis, and in the subsequent videos you can learn more about Sottsass' life and times and the memories of Memphis designer Mattheo Thun. Call the fruits of the Memphis Group's labors dated if you like — "it just looks like the 80s," writes Walker — but they're dated, like many a Bowie or Dylan record, in the best way: undeniably time-stamped, yet somehow always fresh.